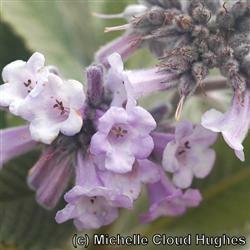 This perennial has wooly gray foliage that causes the pale lavender flowers to stand out . It is drought tolerant and hardy. It has an upright habit and aromatic foliage. A great favorite with butterflies.